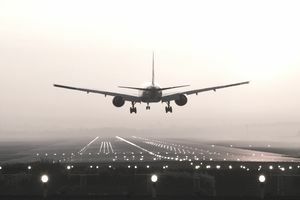 An airplane's center of gravity is not some optional piece of equipment; it's actually one of the most important components of the airplane when it comes to controlling its trajectory. A plane's center of gravity, determined with precise calculations, is a critical factor in guiding and stabilizing the aircraft for a successful flight. If you've ever watched a tight-rope walker, then you may understand the center of gravity. The tightrope walker doesn't fall as long as he keeps his body weight centered directly above the tightrope. If his body position should waver, he might use the movement of an umbrella, outstretched arms, or dangling weights to maintain his balance, or center of gravity, until he re-centers over his tightrope. While tightrope performances are entertaining, when it comes to airplanes, the center of gravity is a critical characteristic that makes the design and loading of an airplane very important. NASA defines the term ​center of gravity as the average location of the weight of an object. In general, the center of gravity of an airplane is the point at which it would balance if it were suspended in air or the point at which most of its mass is focused. The center of gravity is calculated by first locating the datum, a point of measurement set by the manufacturer, often residing at the front edge of the aircraft's wing. Using specific algebraic equations, various weight and inch measurements of the aircraft combine to define the plane's formulaic center of gravity. For example, the arm and moment serve as key inputs to the calculation. The arm represents the horizontal distance from the datum to the plane's center of gravity, and the moment is the weight of the aircraft, multiplied by its arm. The aircraft manufacturer dictates prescribed boundaries for the CG, and aircraft operators must recalculate the CG and reposition cargo and equipment if necessary to stay within these bounds. In a typical light general aviation aircraft, the center of gravity is located just aft, or toward the rear, of the firewall, or just aft of where the engine is. The engine, avionics, pilot, and passengers are the heaviest components on an airplane, and the location of the heaviest items on the airplane will be the approximate location of the center of gravity. On larger aircraft, the CG may vary wildly with fuel locations and loading considerations, making the proper loading of the aircraft imperative to a successful flight. Each individual aircraft is weighed carefully upon certification, and the aircraft's center of gravity and moment arm location are both determined and provided to the owner or operator. These numbers are printed on an official weight and balance form that is kept with the aircraft's operating manual. Any time modifications are made to the aircraft, its structure, or its systems, a new weight and balance are calculated and a new data sheet is created. If a new GPS unit is installed, for example, the aircraft is then reweighed and a new center of gravity calculated and recorded. The pilot in command, or a company's loadmaster or dispatcher, should always calculate the weight and balance of an aircraft before flying to ensure that with the included payload (baggage, passengers, fuel, etc. ), the aircraft will remain within its maximum weight limitations and within its center of gravity limitations, per the pilot operating handbook for the specific aircraft being flown. A center of gravity too far forward or too far aft can cause problems for the pilot, and either condition can be dangerous. A CG that's too far forward can decrease performance. An aft CG can increase performance, but in most small aircraft, will make the airplane unstable and potentially create a situation in which the pilot does not have enough elevator control to recover from a potential stall/spin scenario.